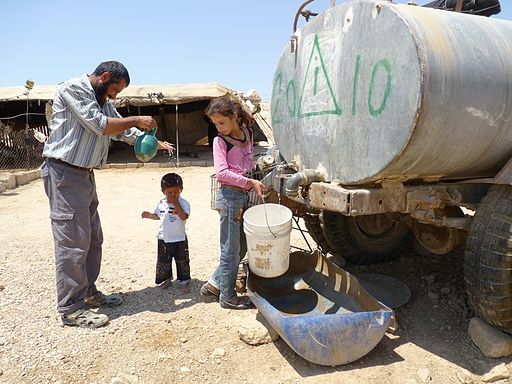 Village of a-Duqaiqah, South Hebron Hills, not hooked up to water grid; villagers purchase water from water-trucks, paying 4 times as much as the average water tariff for private use in Israel. By Nasser Nawaj’ah, B’Tselem. In theory, the PWA regulates the water sector and maintains water resources and services in its territories. However, the current governance framework prevents the PWA from implementing and operating an integrated water resource management system in the West Bank. This includes the fact that the PWA has to get approval from the Joint Water Committee (JWC) for any proposed management measure or infrastructure project in the West Bank. 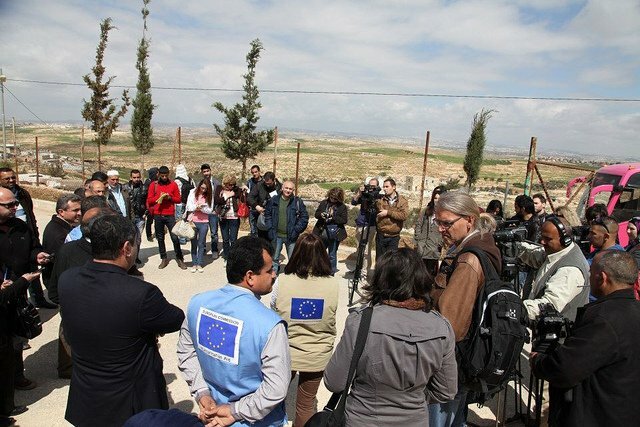 World Water Day Media Tour in West Bank. Photo: ECHO Jerusalem. [i] World Bank, 2009. West Bank And Gaza Assessment Of Restrictions On Palestinian Water Sector Development, April 2009. Available at: http://siteresources.worldbank.org/INTWESTBANKGAZA/Resources/WaterRestrictionsReport18Apr2009.pdf, accessed 21 April 2015.